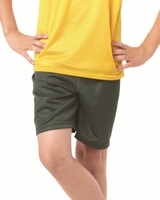 Badger - "6" Youth Pro Mesh Shorts (2207) 6.0 oz., 100% polyester. Athletic cut and superior fit. Covered elastic waistband and drawcord.